It was intended to make Britain Great again but the Brexit victory for Davis, Fox and BoJo is increasingly looking like being on a Pyrrhic scale unseen in modern electoral politics. In a rare move, the Vote Leave campaign has gone public based on receiving a draft report from the Electoral Commission. Quite why Vote Leave it felt it had to break convention on the matter remains baffling. The total sum of it, the Brexit result was won by breaking the law. Fair and square, no other way to put it. ‘So what?’ many Leave supporters will claim. Well, if this side of a referendum campaign can win by breaking the rules, what happens if another Scottish independence referendum is played by these new rules: to hell with the consequences, do whatever needs to be done. But it doesn’t end there. Westminster SNP Leader, Ian Blackford MP, has asked Theresa May what checks the Scottish Tory party had in place before accepting large donations from a controversial trust – the Constitutional Research Council- and if she would investigate the links between her Party and the trust with a promise to publish all donors and donations. An investigation by BBC Spotlight Northern Ireland reported the practices of Richard Cook, the chairman of the Constitutional Research Council and former vice chairman of the Conservative Party in Scotland. The Ferret, an investigative journalism website has revealed evidence suggesting that Scottish Unionist Association Trust – which has bankrolled the Scottish Tories to the tune of nearly £320,000 – does not meet the criteria that they are an ‘exempt trust’. Suddenly that teflon veneer which Ruth clearly has in abundance is likely to be tested to its maximum. Journalists of any hue do like a financial scandal regardless of who it hits. More importantly, it’s crunch time for the Tory Cabinet this week. Hard or soft, the Tory party will never agree on anything when it comes to Europe. It lost them power in the 90s and appears ready to do the same for them now. Frustratingly, Corbyn’s pro-Brexit stance is a disgrace to the vast majority of Labour voters who voted to Remain. Increasingly the polls are swinging from pro-Leave to ‘let’s only come out of Europe to control who comes here’ but anything else that affects my job and prices, well they can stay. Hence support for a second referendum is now in the lead for the first time in two years since the Brexit referendum. 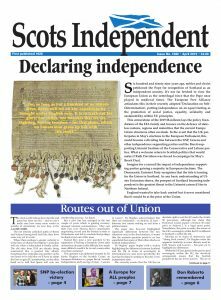 Brexit brings with it the power grab from devolved institutions. Bit by bit, the Eurosceptic Tories and their spineless Remainers are dismantling the very fabric and values of what many No voters saw as the very essence of being better together in the UK. Heck, even the architect of the second Scotland Act, Sir Kenneth Calman is questioning whether Brexit Britain is really the end state that so many liberal and social democrats who voted No for. Finally, to move things along, I am praying for England to win the World Cup. Not withstanding that I am the eldest grandchild of a Scouse lady of the night, to have wall-to-wall commentary of how Great Britain is again, now that England has won the World Cup for a second time, must be worth a few hard earned percentages points for Yes. Cannot work out what Chequers did. Probably the EU will tell us when they work it out.